Swing, blues, rock and pop are all part of the musical fare for the Jazz Orchestra. In a standard big band line up of trumpets, saxophones and trombones supported with a rhythm section of drums, bass, keyboard and rhythm guitar, the Jazz Orchestra takes players from Grade 4. 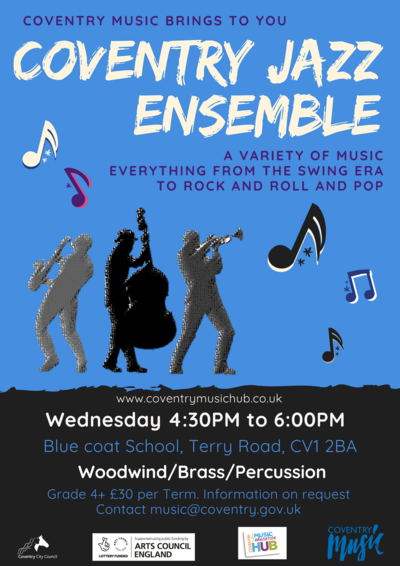 Young players explore the world of improvisation with repertoire from ‘laid back’ ballads to ‘up tempo’ dance numbers. With performances at Warwick Arts Centre, the Belgrade Theatre, the Godiva Festival and Coventry Motofest, the band is known for being exciting and uplifting. You need to be Grade 3+ and play woodwind, brass or percussion to join this band. Please contact us for more information about how to join.